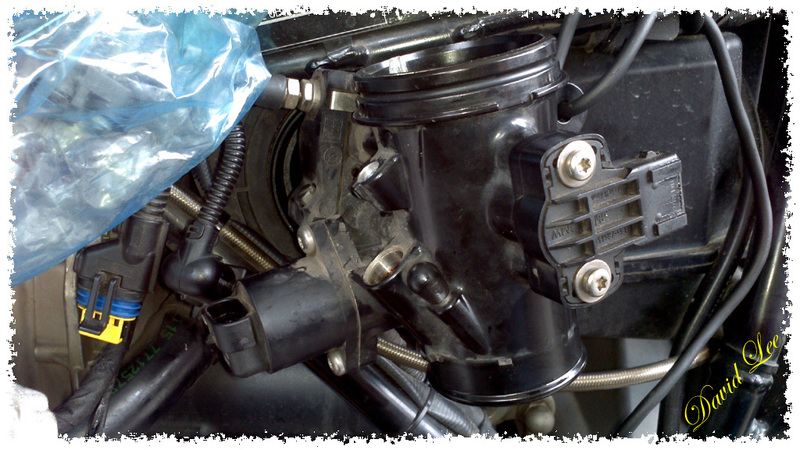 [Jul 2010 @ 2,000km] – On some R1200 GS manufactured in 2010, oil can be found leaking from the left hand side engine casing. 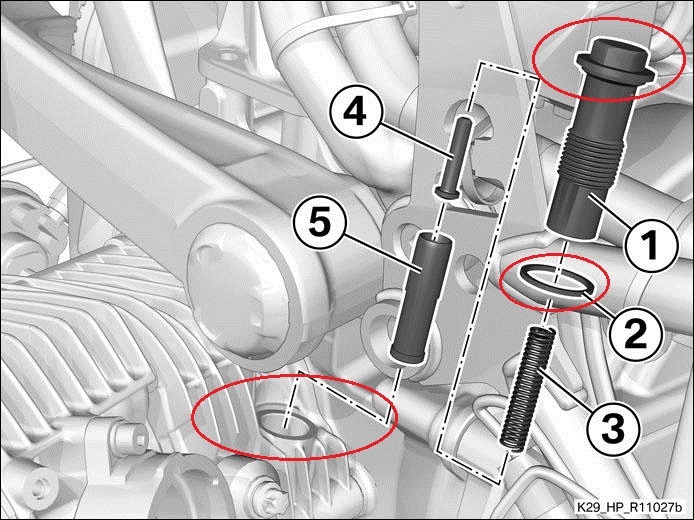 This leak can be traced to the left hand side cam chain tensioner, item(1) and washer (2). I found the leak on my bike not long after the first 1,000km service. Used a 15mm ring spanner to tighten some more, I could get it to move a further 1/8 of a turn. Cleaned the area and at 97,000 km, have not seen a leak. Diagram showing the left side camshaft timing chain tensioner. [Nov 2012 @ 97,500km] – I couldn’t stand the rattling (about 2 seconds) that’s coming from the left side of the engine every time I started the bike, especially when the engine oil is not fresh. On my R1150GS Adv. the same thing could be heard and I had the left chain tensioner replaced with a newer part number. It solved the rattling noise. So why is it returning on the R1200? Could be the higher oil pressures required in the camheads or the design changes made to the chain guides. Who knows? I just had to give it a try and investigate. Removed the left injector nozzle, stepper motor and TPS connections along with the throttle body. 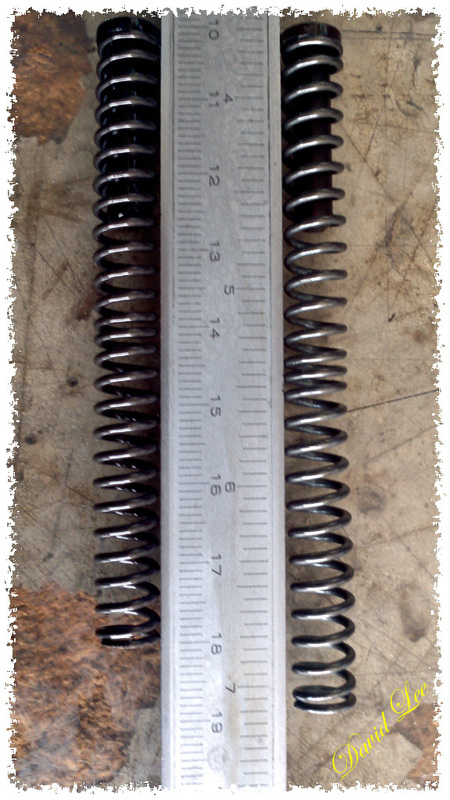 The old (left) and new (right) springs. The culprit, the spring has weakened and shortened by 10mm after 90,000km. It’s still functional as a component, as the chain does not depend on the spring tension during engine operation. Oil pressure of 6 Bar will maintain the tension on the chain guides, timing chain and proper camshaft timings. The cam chain tensioner part number is 11 31 7 707 797. Spring is not sold separately. Replace the washer gasket 07 11 9 963 342 every time you remove the component, else you’ll find oil leak. You don’t have to get the BMW item, some hardware store should have them.